Here we go with another of these star-studded tribute albums, this time the collection is dedicated the The Beatles. Why does it seem like so many of these have been released in the last five years? Are they simple and cheap to put together? Do the musicians actually record together, or do they just phone in their parts? And why does it seem like Bob Kulick is always the ringmaster? I don’t think Butchering The Beatles is an appropriate title, because most of these songs are pretty cool and stay relatively true to the originals. Sure there are a few stinkers, like the Billy Idol and Doug Pinnick tracks (did “Taxman” always sound like the theme from the Batman TV show, cause it sure does here), but for the most part things are pretty solid. Alice Cooper, Lemmy and Kip Winger deliver exactly what one would expect from them, no surprises there. What did surprise me was Geoff Tate and John Bush, two vocalists I’ve never really gotten into, doing commendable jobs here. ZZ Top‘s Billy Gibbons twists “Revolution” into a boogie rock number and it works like a charm. My favorites are the renditions that teeter on the edge of metal, adding something a little different to the Beatles classics. John Corabi does what he does best with “I Saw You Standing There” and Tim “Ripper” Owens shocked me by doing such a great job on the tough “Hey Jude”. And the best of the bunch is Jeff Scott Soto teaming up with Yngwie Malmsteen on “Magical Mystery Tour”. Malmsteen goes crazy every chance he gets, but none of it sounds out of place while Soto gives the song a nice set of balls. 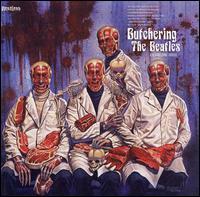 Butchering the Beatles is a pretty cool release, with some killer artwork. At first glance it might look like people were just invited to participate for name recognition, but the covers themselves hold up well. Now can someone explain to me why Bob Kulick seems to put out so many of these things? Reviewed by Skid for Sleaze Roxx, October 2006.